In May 2010 the world of Hard Rock / Heavy Metal lost one of its most talented stars, with the passing of Ronnie James Dio. During his career he sang for Rainbow and Black Sabbath, as well as his own eponymous band (Dio). With his incredible vocal range he sang some of the real classic songs in rock and metal. Several of his albums were re-released last year in Deluxe Edition form (‘Holy Diver’, ‘Sacred Heart’ and ‘Last in Line’), and now it's the turn of 'Dream Evil'. As with the other Dio Deluxe editions, it comes with an expanded booklet with notes by Malcolm Dome and is endorsed by Ronnie’s widow Wendy. As well as a re-mastered version of the original album, like the other Deluxe editions, this one features a bonus CD with extra material. The bonus material here consists of one song from the Dio EP, a single edit of 'I could have been a dreamer', and 12 live tracks recorded at the Monsters of Rock festival at Castle Donington on 22nd August 1987. 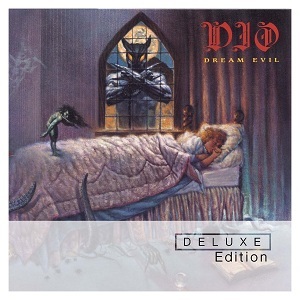 While the album is superb (an all-time classic in my opinion), and there is plenty of stuff on the bonus disc, of the Dio albums this is the weakest Deluxe edition I'm afraid. Any Dio fan who has the album 'Live at Donington 1983 & 1987' which was released in 2010, will already have these live tracks, so whereas the previous Deluxe edition releases have offered lots of new or rare material, this one effectively just gives you a load of bonus material copied directly from another album. As a result of the vast bulk of the bonus material (12 out of the 14 tracks) already being widely available then whether or not you should buy the album becomes a slightly harder decision. If you haven't already got a copy of 'Dream Evil' then it's an essential addition to the CD collection of any rock and metal fan. If you already have 'Dream evil' then then it depends if you have a copy of 'Live at Donington 1983 & 1987'. If you do then this album is only for completists. If you don't then it's certainly an attractive purchase, but personally I wouldnt buy the deluxe edition of 'Dream evil' just for the live tracks - I'd get the live album instead which also give you the 1983 perforance too. In summary then - if you don't have 'Dream Evil' on CD then this is a great buy - otherwise it's really only going to appeal to completists.